WOW I am in love with that light fixture!! I love that red and white fabric too... can't wait to see the finished room! Love it all and the lighting is fabulous!! adorable! I think a light fixture like that is just what my girls' room needs...love it. Ok, what a tease with that lattice lamp! Can't Wait, its looking good so far! 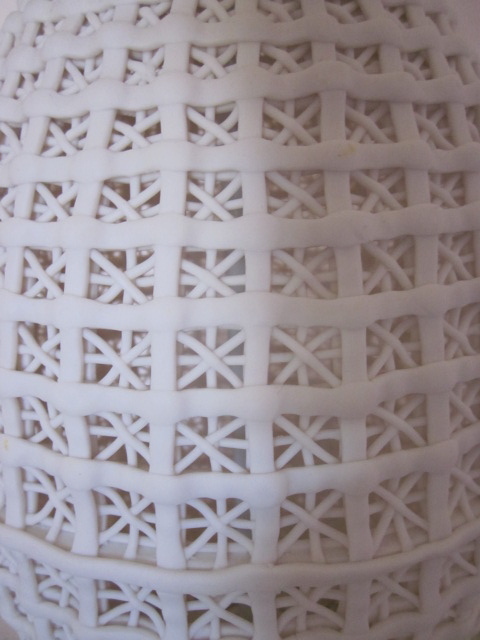 Love the sneak peek...the porcelain lamp is going to be wonderful!! *** It's sure LOOKING PRETTY! And I ADORE that red & white fabric with the chintz!!! Know you've thought it all out beautifully (that's obvious!) & can't wait to see it all together... what a space it will be!!! Just "thinkin' out loud here"~~~ have you considered the possibility of the prettiest pale yellow or a soft, minty green instead of the pink for the walls? I love what you have picked so far! The lamp is gorgeous. Have a nice weekend. The details are beautiful- I love what I see so far! yummy! such a great room for a little girl. question: is that one big bolster pillow? where did you find insert. need something similar. Oooooh!!!! I cannot wait to see the finished product. These are adorable peeks. That light fixture is interesting and very different I like that!